Preparing to mow the lawn last Saturday, I parked the car out in the street in front of the house. 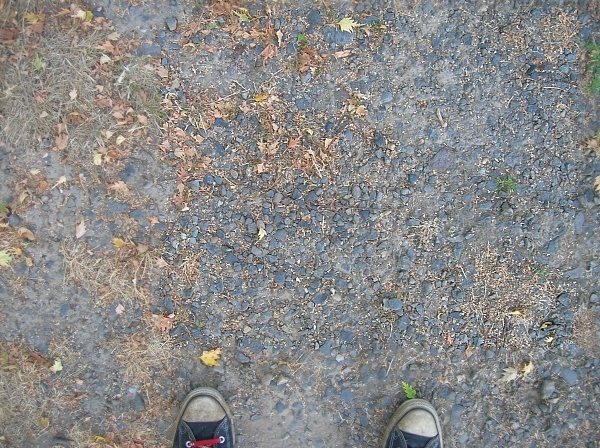 Our street hasn’t been re-paved in at least forty years and we have no sidewalks or gutters, so water tends to run down the steep hill above us in well-defined rivulets off to the side of the street. In the summer I like to park in those channels, as they are off the street, but not part of the yard. 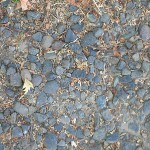 There is a lot of gravel in that section of the street, most if it washed down the long hill, a slow migratory sluice. 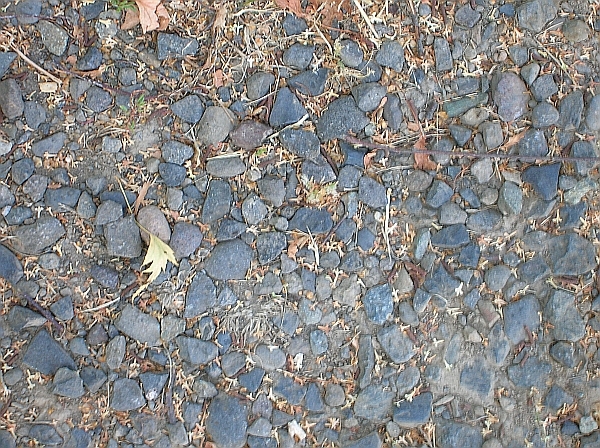 The gravel in front of our house has been compacted by car to the extent that it mostly resembles exposed-aggregate concrete. Pretty solid stuff. That particular day I parked the car with great care, methodically maneuvering close in next to our grass, while getting as far out of the street as humanly achievable—back and forth several times, eventually placing it in precisely the prescribed position. I exited the car and moved toward the back, I’m not certain why. 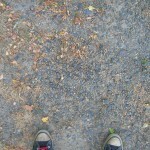 Looking down as I reached the rear bumper, my eye caught sight of a flat rock. Not that big, it was perhaps an inch and a half in length and maybe three quarters of an inch wide. Black (well, in direct sunlight, a very dark olive green with a faint golden sheen). 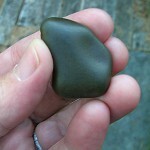 Though flat, it stood out from the other tire-polished stones. It was smoother, with a different luster. Something attracted me to it. It’s not like I keep a lot of rocks, but I occasionally keep rocks I’m attracted to. Don’t get me started. It’s an element of my extended OCD. The rock in question appeared to be a keeper. The perfect flatness of its exposed surface was quite appealing. I picked it up and headed into the house. Upon closer inspection, it soon became apparent that this was no ordinary rock. For one thing, it gave off some sort of benign vibe. Nothing intense, just a mild cosmic warmth. The rock was vaguely shaped like the state of Nevada—if there is any sort of significance to be found in that fact. 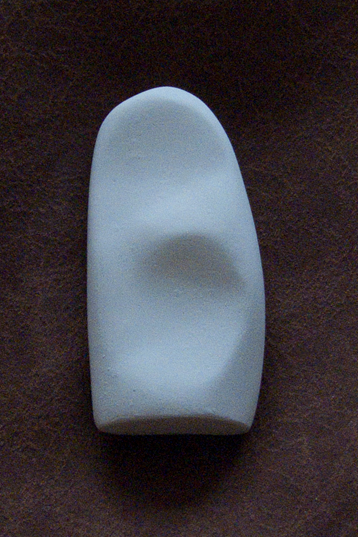 The surface opposite the flat side is contoured, as are the edges. 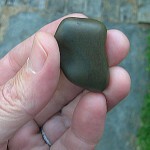 To look at it, the rock appears to be nothing special, rather ordinary, but for the antique gloss of its velvety patina. However things change when you hold it in your hand. It takes a while, sorting it slowly between your fingers, to find the proper alignment (there are actually several). 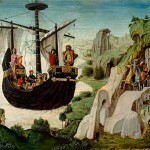 But eventually a certain celestial conformity takes place, as one cradles the mysterious object. Its pleasing curves and satisfying roundness perfectly tapered. It’s a stone that demands to be rubbed. That’s it! 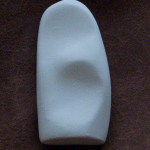 It’s a worry stone. But not like any other I’ve ever seen. If you google the term you find a real array of various pieces. 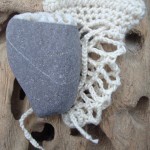 All created with a similar intent and purpose, but perhaps, for the Irish wishing stone. Although, who is to say what is to come from any sort of talisman upon which one places a great deal of concentration and energy? 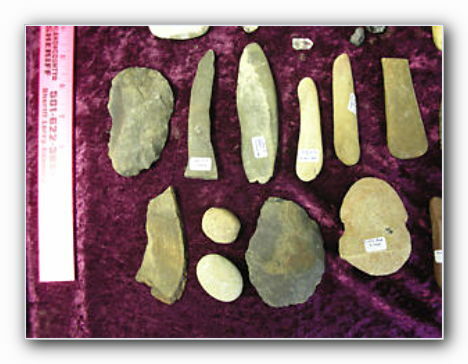 From what I gleaned in my scant research trying to figure out the whole worry stone game, it became readily apparent that the objets have been with humankind for quite some time. Only slightly less older than dirt, I’d say. However this does open for us an important philosophical question. Which came first, the dirt or the rock? It’s been said that the ancient Greeks kicked off the craze—most likely because their advanced culture was more worrisome than most and they had a lot of free time. 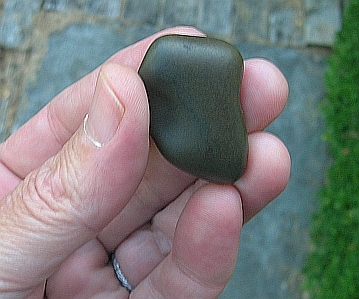 The first worry stones are purported to have been smooth sea rocks. 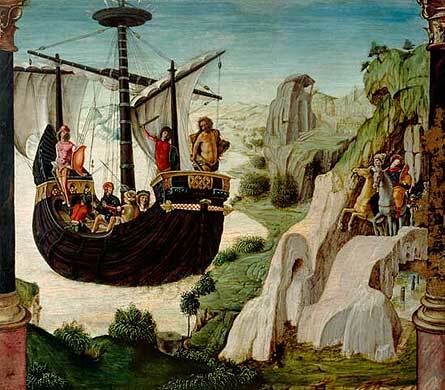 Given their seafaring ways (see the Odyssey and Jason and the Argonauts) it’s easy enough to understand that they might have seen an alluring sea rock or two in their time. I mean, check out Jason’s run-in with the Symplegades. But a smooth river rock would probably do you just as well in a pinch. 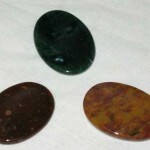 These days, judging by what one is likely to find online, most worry stones are pretty simple affairs: oval-shaped, semi-precious gemstones polished to a glassy sheen, with an indentation in the center. Most of them look like stone re-workings of a half-sucked Original Werthers hard toffee. There are variations. 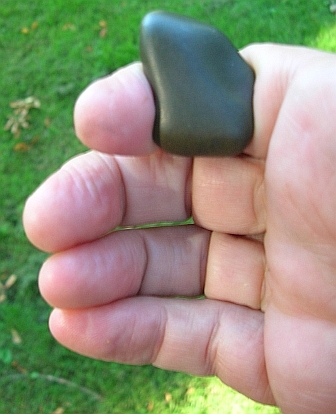 An Irish wishing stone appears to resemble more an outright rock than the other samples, most likely requiring some sincere effortful wishing in order to erode and abrade the hollow to conform to the shape of the thumb and fingers. Cunningly contrived contours, oh my! Maybe a tad grandiose, but I think what the good plumber monk was referring to was that the things are damn good stress relievers. 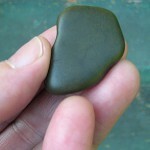 That seems to be the consensus among all the hierachies of worry stone lovers and aficionados in the Wiccan and pagan communities as well. So the upshot here is that the rocks are fully sanctioned in all the corners of the new age universe—if, indeed, it is possible for the universe to contain corners. 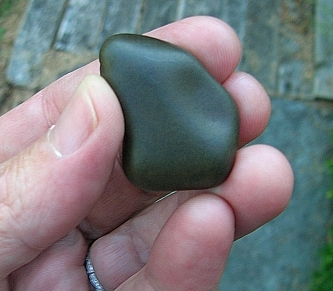 While adhering to all ordained worry stone standards, the one I found is far superior to all other examples I could uncover. For one thing, not just the thumb groove but all edges on mine are perfectly rounded—all surfaces maintaining a sublime camber. Rather than by machine, it is obvious that the soothing curves and arcs were all worked by human digits over time. Over a long time. 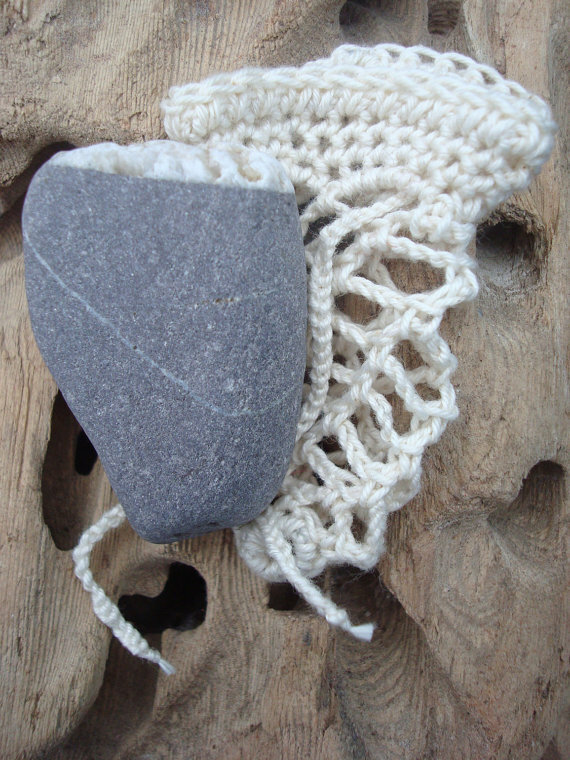 A lot of energy went into the shaping of my stone. Nagging questions remain: How the hell did the rock get out there in front of the house in the first place? And how long was it lying out there before I discovered it? 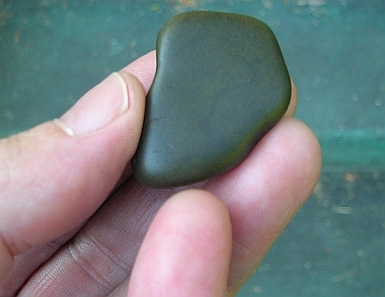 How does the possessor of one lose a worry stone? If you had it in your hand and were to drop it, you’d certainly pick it up. Was the person standing in front of our house when he inexplicably decided to empty his pockets or try to fish some change from his pocket. Or what? And what was he doing standing in front of our house anyway? We live at the very end of a dead-end street at the bottom of a very steep hill. We don’t receive a lot of passersby. So then, perhaps erosion unearthed the relic from decades of quiet slumber. 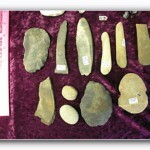 It bears the quality of a Native American arrowhead or some other such artifact. My imagination prefers this theory. The stone feels old (well, of course it’s old, it’s a rock, fer crissakes!). It feels as if the human energy it stores is old—antique, from another time, long ago. But some residual guilt persists. I’m not sure what I should do with the thing. 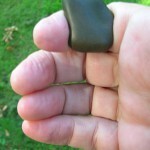 Is it wrong to keep a found worry stone? And what are the ramifications? Will it confuse the stone if I were to worry on it too? I don’t know the rules on such things. Perhaps it deserves a proper re-burial? I don’t know what protocol is in these situations. I suppose I could go door to door around the neighborhood to see if anyone lost a valuable, semi-precious “object.” Make the possible owner describe the item in specific detail. The other option is to put an ad in Craig’s List or something. That seems like it might be casting too big a net, given our home’s somewhat remote locale. Whatever the case, something needs to happen soon, as I am beginning to become attached to the stone. There is great pleasure in stroking its smooth coolness. The notch on the left edge perfectly fits the distal interphalangeal crease on my right index finger. The slight hollow on the right edge of the stone nestles against the palmar digital crease as if carved specifically for my grip. But there is no right or wrong way to hold it. Cradle it in either hand, slab side up, or contoured. 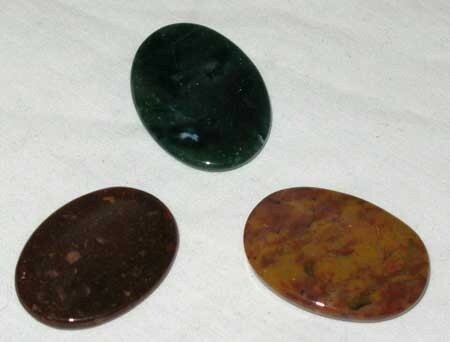 However it may be held, the special stone finds folds among the fingers and quickly comfortably conforms. See? I’m already developing a fetish for the thing. Why do I feel like this is a mystery that will never be solved? I recently received my twentieth rejection letter from a reputable literary agent for Unreal Gods. I feel like a salmon swimming upstream against the current. I have revised the book, cutting four early chapters. (which I’m not even sure is such a good idea)- but I’m trying to make submissions of the first three chapters or one hundred pages move faster (I’m not sure that is a good idea either). Honestly, writing biblical haiku is easier.